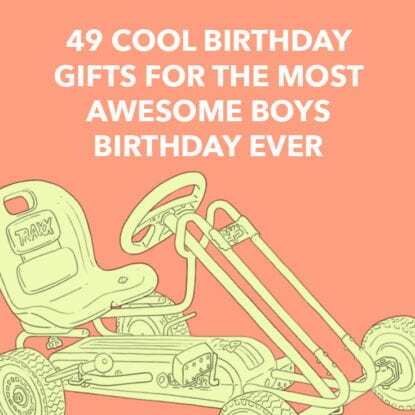 Think out of the box with this list of birthday gifts for Grandpa, so that instead of old clichéd items, you can check out fun t-shirts, mugs, stunning hampers of fruits and chocolates, or terrific keepsakes that help the senior of the family pass his experiences on to his grandkids. 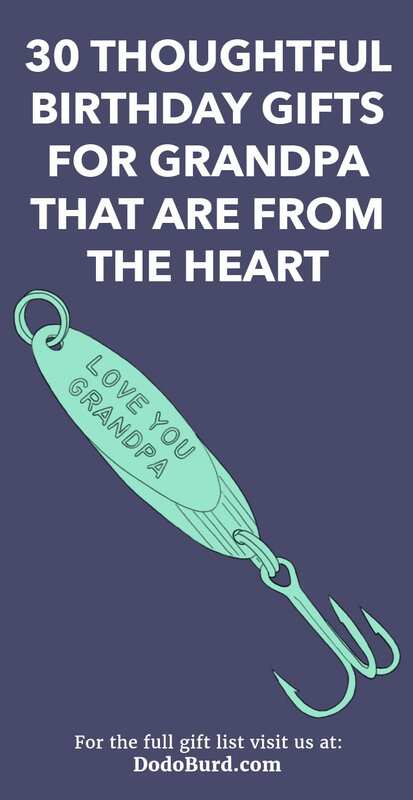 Speak to your gramps in a language he understands with this special fishing lure that tells him how you really feel. 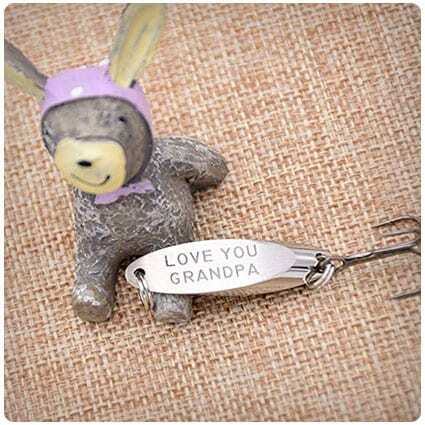 Made from stainless steel and silver plated, this is not only a practical present, but also endearing, which makes it the ideal birthday gift for a grandpa. He’s the mainstay of the family and always there to patch up a broken toy or maybe a broken heart. 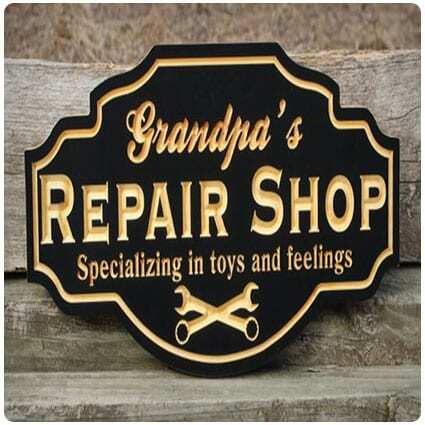 Give your grandpa the love and respect he deserves with this heartfelt custom carved sign that includes a double coated finish to protect it from inclement weather. Remind him everyday of that wonderful stage of life he’s in by giving him this fun mug with its cheeky logo. With a sublimation print to guarantee a pattern that remains, this 11oz mug will be a joy for Grandad’s morning coffee, encouraging him to cherish his loved ones around him. 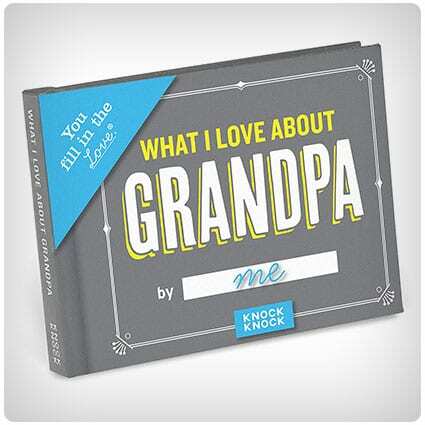 This clever book gives your kids a format to follow so that they can explore and understand what they love about their Pops. Once completed, it makes a terrific gift in its hardcover with removable clear plastic jacket, something he can treasure for years to come. If your grandad’s a football fan then this stunning gift will be most welcome. 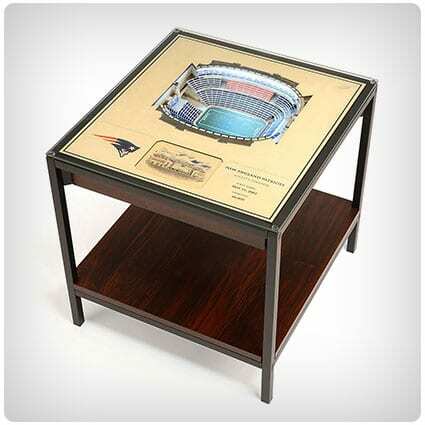 This beechwood table has, under its glass top, an exact 3D replica of his favorite stadium, hand made in popular wood and including LED lights in the all the places the original stadium lights up the turf. 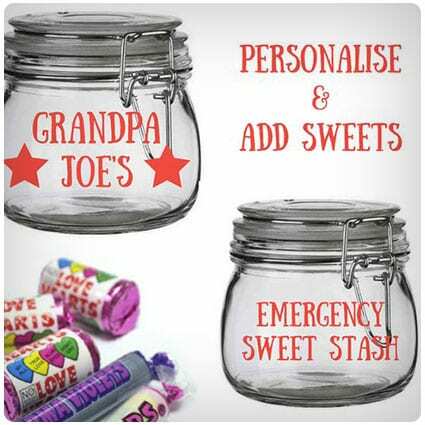 Let your kids connect with their grandpa by gifting him this personalized sweet jar that he can then stock up and share with his grandchildren. There’s chosen wording on the front and back and a sticker on the top of the jar, to make this simple vessel something deeply special to him. Grandparents love to spend time with their grandkids, especially around food, and this gift will encourage that further. Haul out that special treat and serve it up with this charming spoon that will be a reminder of those precious times spent with the kids around their favorite ice-cream tub. 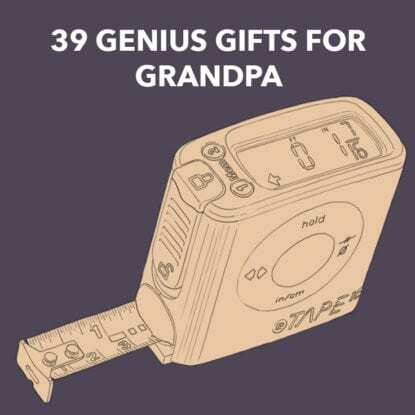 If Grampy is struggling to know what to do with the kids then help him out with this imaginative present which provides inspiring solutions. With a set of 20 shared experiences to choose from that range from silly to scientific, this pack will encourage the bond between the ages. 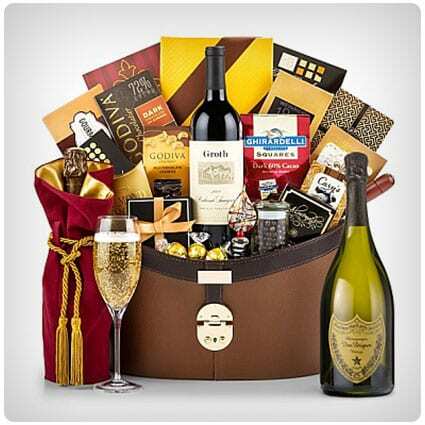 Totally indulge your grandfather with this decadent offering which features a precious gift of Dom Perignon 2009, in a signature keepsake dual toned leather serving tray. He’ll feel nothing but love with this stunning arrangement of sweets and savories, letting him know how you feel about him. In an age of electronics, engage your grandad in a way he understands with this set that inspires your kids to write old style letters but in fun and amusing ways. 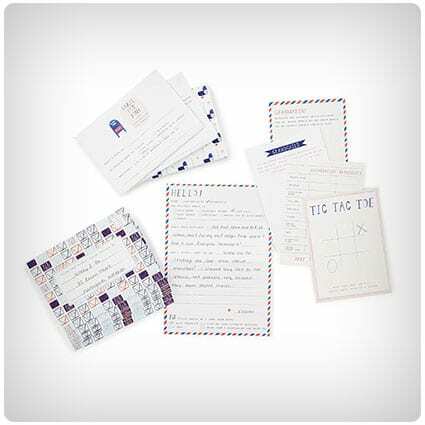 A pen pal kit unlike any other, this set even has cheery envelopes and playful illustrations to prompt your children into writing action. 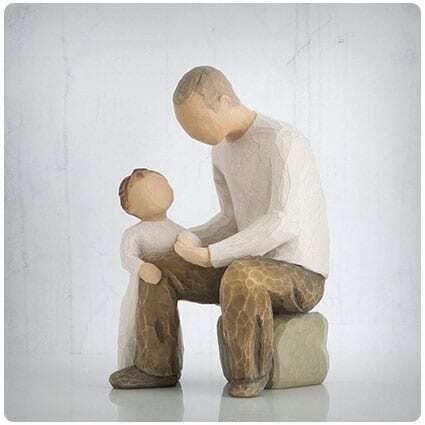 This heartfelt carving is the perfect birthday gift for Grandpa, letting him know the appreciative love you have for all that he does. The 6 inch hand painted, resin figure comes in a fitted box ready to give, and is cast from the artist’s original hand carved work. 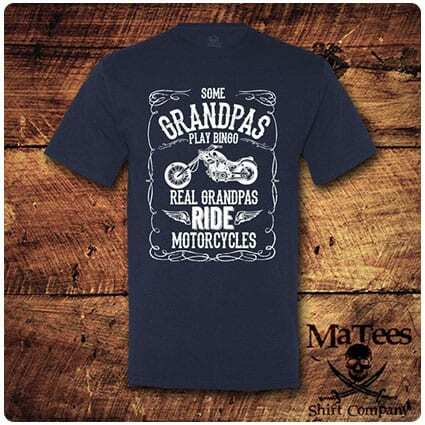 This ideal present for a grandfather who likes the open road on two wheels will be worn with pride, once he understands how cool he looks to his grandkids. Based on a Fruit of the Loom t-shirt, this is a quality tee to be displayed to the world whenever he opens up that throttle. What is more delicious than a hot tub of popcorn covered in a special salt that just smacks with flavor? This present comes with 2 pounds of raw white popcorn kernels and 3 different salt cellars from one of the world’s finest salt makers. Let his lips riot with unique tastes. Why appreciate your grandpa only on his birthday when you can give him something special every month with this terrific gift box subscription. Including 5 personal photos and a custom note in every delivery, he’ll get a themed box that will surprise and put a smile on his face. Give his taste buds a wild holiday by gifting your grandfather this magical sample set that comes in a fairy tale box and has 9x3oz jars of premium Savannah bee honey. Arriving securely wrapped and with a complementary gift card, the set also contains an informative book on the amber nectar. 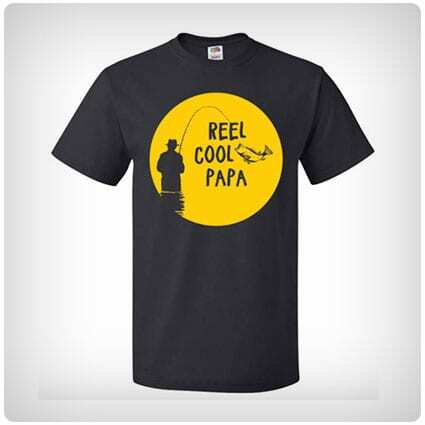 Spoil your grampy with this cool fishing t-shirt which is custom made just for him. Made from 100% pre-shrunk cotton, it has a double needle sleeve and a bottom hem and is styled in loose fit for comfort. With a humorous motif, this is one t-shirt that is bound to reel him in. Keep him happy on a regular basis with this subscription box set that is designed for older people. With items like bath products, crafts, activities and healthy snacks included, the boxes can also be tailored to each loved one’s needs and there’s a donation box given out to a senior with every 15 sold. For a senior that likes their food, this carefully selected treat of fruit and chocolate will be a delight. Incorporating fresh pears, apples, and juicy oranges, along with Godiva chocolate covered almonds, pretzels and more, they’ll burst with pride on receiving a gift like this from their grandchildren. This stemless cup is customized just for you and has an engraved design that lasts a lifetime. Capable of retaining ice for up to 24 hours and hot liquids for up to 6 hours due to double walled vacuum insulation, the cup will fit almost any holder. A shatterproof lid protects you from spills. 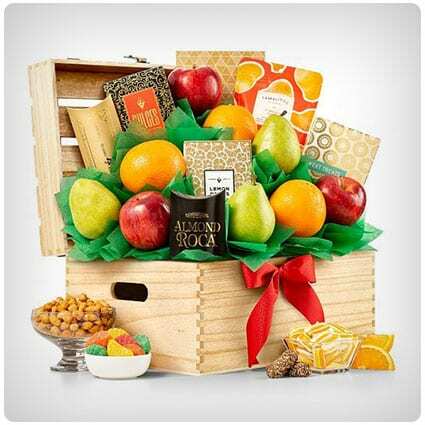 This exclusively designed keepsake chest is the perfect treat for the seniors in the family, blending quality snacks with delicious juicy fruits. Catering for all tastes with caramels, almond Roca, pears, crisp apples, and juicy oranges, this makes a sumptuous birthday gift for Grandpa, giving him life and vitality through food. Give your grandad a laugh with this comic t-shirt that he’ll love to wear out and about. Screen printed and made to order, this t-shirt is made from 100% cotton and is pre-shrunk with a design that is produced from quality inks to last longer than the tee. For a gift that your Grandpa will appreciate, try these handmade artisan chocolates that are crafted exclusively for chocoholics. From creamy truffles to chewy caramels, there’s something for all tastes, including crunchy nuts enrobed in 3 different types of chocolate. 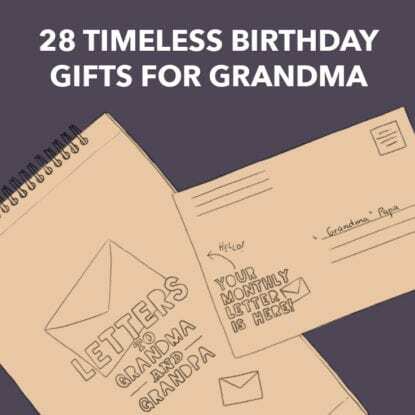 If you need something that will last a lifetime, get your grandfather this set of nostalgic cards that are bursting with personal prompts to engage grandparents and grandchildren into a letter writing habit. The letters are stored in the secret book pockets to make a timeless keepsake to enjoy. Let your grandad know you love him as he starts each day with this printed and pressed mug, which is washable on the top shelf of the dishwasher for his ease. Customize the mug with a choice of name and select a size for the mug that best suits. If you’re throwing him a birthday party, then this handmade and customized t-shirt is ideal wear for the king of the celebrations. Made from 100% cotton and eco-friendly inks, this top is guaranteed to put a smile on everyone’s face without causing offence or damaging the environment. This soft and comfortable t-shirt will bring a wry smile to any face and actually makes Grandpa look even cooler. Made from cotton and polyester, the top has a custom designed graphic by the maker which is cut from heat quality transfer vinyl for a professional finish. For the pops who loves his sports, simply send him a subscription from Fanchest and he’ll receive a curated gift box of officially licensed sports gear from his favorite team. Blend his passion into fashion and he’ll be the best dressed fan at the stadium in no time. 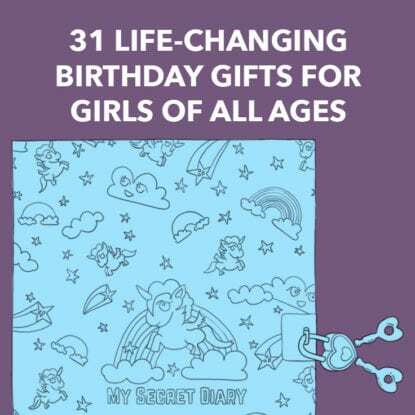 Give the gift that gives back with this inspiring journal to be passed onto the generations to come. Organized into 9 easy sections with writing prompts to create terrific personal memoirs, this sewn, clothbound journal will quickly become a family heirloom that will become a personal record for those that follow. Make him howl with a laugh out loud t-shirt for your grandpa, or should we say, “Your Partner in Crime”. Ideal for that statesman of the family who always ends up taking the kids beyond family limits, this quality t-shirt will be enjoyed by seniors and juniors alike. For a personal and different gift for your grandfather, check out this fun blog that will show you how to send a personal hug through the post. By creating a representation of your kid’s arms in a hug embrace, your grandpa will receive the best gift of love that there is. Some of the nicest gifts are handmade and personal, and with this blog you can create one of the best. 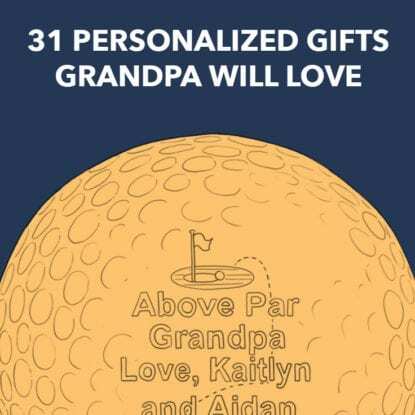 By making a single letter to represent you Grandpa’s name, you’ll be shown how to decorate this delightful offering with pictures and items to personalize this special present. Give your grandpa a personal keepsake with this fantastic map idea in this creative blog. By using state maps, you’ll highlight where the key people in his life are and bring them all together in one special design. A fun and inexpensive birthday gift for a special grandfather.